I wouldn’t say I’m ‘scared to death’ or anything by them, (except for one time in Panama City, Panama when a hissing cockroach turned flight to fight. The thing was the size of a baby’s shoe…and had eight girls running for their lives. Terrifying.) but I don’t have any interest in bugs. A few months ago, I was teaching one of my beginner English classes about pets. After getting through the basics…(rabbit, cat, dog, hamster, fish) I asked them about what pets they had at home. One little boy piped up that he had a _____(korean word ?). Having NO idea what that was, I spent the next 15 minutes of class trying to figure it out. Finally in pure desperation, I had him draw a picture. He responded proudly, “Yes.” He went on to tell me its’ name and age. I was blown away that a kid would have a bug as a pet. And he loved it. 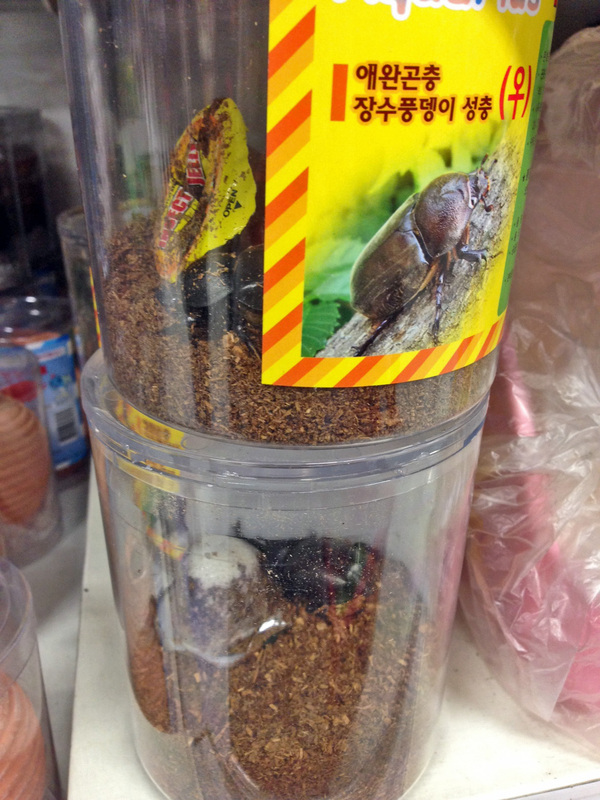 A few weeks later I was strolling through the pets section at the local Home Plus (basically a Walmart on crack), and noticed that they not only had beetles for sale, they also had grubs! If you know, I’d love for you to share your knowledge! The time my stall played music while I was on the toilet. The time my school had the doors wide open in the winter. The time my kindi student had a bloody nose.